Analysts say it is a case of over-promise and under-delivery. It was Vietnam in 2007, Brazil in 2009, Indonesia in 2012, and now, India. Foxconn, the world's largest contract manufacturer of electronics goods, has pledged an investment of $5 billion (Rs 32,500 crore) in Indian factories, as well as the generation of 50,000 jobs here. However, only a fraction of the Taiwanese company's commitment to invest up to $12 billion in Brazil and $1 billion each in Indonesia and Vietnam, as well as generation of thousands of high-value jobs in these countries, has materialised. Analysts say it is a case of over-promise and under-delivery. "They've done the same in Brazil, Indonesia, and Vietnam. In Brazil, they got the government in trouble because the numbers were touted as a major FDI (foreign direct investment) win," said Alberto Moel, a Hong Kong-based analyst with Sanford C Bernstein, an investment management firm. Since Prime Minister Narendra Modi began his flagship 'Make in India' campaign last year, Taiwan has been a go-to place for Indian officials to attract global companies to India and revive local manufacturing here. The small island nation around 180 km east of China has a strong technology manufacturing base, with Taiwanese firms making semiconductor chips, servers, smartphones and television sets both locally and in neighbouring China. Maharashtra Chief Minister Devendra Fadnavis said Foxconn's initial focus would be to make TFT (thin-film transistor) semiconductors in the state, but did not elaborate on the plans. The plant in Maharashtra would resemble the one the company had in China, said a Maharashtra government official. Bhushan Gagrani, chief executive of Maharashtra Industrial Development Corporation, said the company had been shown a few sites, including at Talegaon in Pune district and Khopoli in Raigad district, for its proposed investment in 1,500 acres. 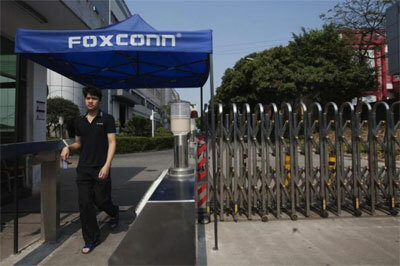 However, Foxconn, which has a 90-member team of supply chain vendors surveying the locations, is yet to take a decision on the matter. A likely site for the R&D facility is Khalapur, close to the Jawaharlal Nehru Port in Navi Mumbai. During his stint as electronics and IT secretary, Telecom Regulatory Authority of India Chairman R S Sharma led a delegation that wooed Taiwanese firms to build factories in India. On Wednesday, the Taiwan Electrical and Electronic Manufacturers Association, a grouping that represents about 3,000 small and medium firms from Taiwan, signed a pact with the Karnataka government to set up units in a Taiwanese cluster in Bengaluru. Typically, Foxconn follows its clients in setting up factories. It shut a factory on the outskirts of Chennai that made phones for Nokia after Microsoft bought the Finnish firm and decided against making phones locally. Early this month, it began producing phones for Xiaomi within 100 days of the Chinese firm deciding to sell locally produced smartphones. But the company's move to announce a $5-billion commitment, the single largest foreign investment pledge in Maharashtra, came as a surprise. "The reported commitment of $5 billion is excessive unless it also involves significant infrastructure projects outside the building and outfitting of factories. For instance, the global SMT (surface mount technology) equipment market has been forecast to reach $4.5 billion in 2020," said Mike Buetow, editor-in-chief of Circuits Assembly, a US magazine focusing on the electronics sector. As such, the global forecast for investments in SMT equipment, used to make electronic hardware, would be less than Foxconn's pledge in Maharashtra through the next five years. So, will Foxconn be serious about India? "We have been looking for other places but initially, the focus is (on) Maharashtra. The unit will have a manufacturing facility, as well as an R&D (research and development) unit," Foxconn Chairman and CEO Terry Gou said in Mumbai on August 8. In a statement to exchanges, Adani Group said it was in talks with Foxconn to set up a unit in Gujarat. On August 4 in Delhi, Gou spoke of manufacturing various items, from solar goods to mobile equipment to smartphones, in India. The company wasn't only looking at "assembling" in the country, but bringing the entire "supply chain to India" and focusing on a 10-year horizon, he said. In July, he said his plans would generate a million jobs in India. The same month, a delegation from Foxconn said the company planned to create a venture fund to invest in start-ups, as well as an incubator to mentor those. Gou, a flamboyant self-made man with a passion for Taiwanese and Chinese work ethics, is optimistic that India presents a manufacturing opportunity. India is already the fastest-growing smartphone market in the world. Last year, its electronics imports were worth $33.5 billion. By 2020, the country is expected to spend $400 billion on electronic goods, including smartphones, smart television sets and wearable devices. Of that, $300 billion is likely to be spent on imports, and the rest on local manufacturing. If Foxconn's customers such as Apple, Sony, Sharp and Huawei look at local manufacturing to serve customers here, the company could potentially deliver on its pledged investment in this country. Emails sent on Thursday morning by Business Standard, seeking comment from Vincent Tong, chairman of FIH Mobile Ltd Co, a unit of Foxconn, and Foxconn's global spokesperson, remained unanswered. Moel of Sanford C Bernstein, who tracks Foxconn, besides the entire technology manufacturing sector, says the Taiwanese firm is creating hype without substance. "EMS (electronics manufacturing services) assembly is essentially a very low capital-intensity business. In China, Hon Hai (Foxconn) supports over a million people on a capital expenditure run rate of about $1.5-2 billion a year. I don't know where they would even consider putting $5 billion on the ground, or for what purpose," he says. "They are very sketchy because they don't have any real plan as to what they intend to do. They are certainly happy to support their existing customers (Xiaomi, etc) in the push in India, and the 'Make in India' initiative leads them to make some investment in the country," Moel wrote in an email. "I'd be surprised if this number is even a 10th of what's being discussed." Buetow of Circuits Assembly shares the view, "based on Foxconn's failure to deliver on many past promises". Foxconn boss started business with a loan from his mother-in-law!